One of the world’s most recognizable sci-fi stories, H. G. Wells’ The War of the Worlds established numerous conventions for the genre, including the threat of an invasive, extra-terrestrial species, space travel and intergalactic conflict, inspiring directors, gamers, producers and writers alike with its sobering story of struggle and survival. Marrying the suspense, drama and urgency of Wells’ original novel with Jeff Wayne’s rousing and flamboyant score, Audible’s new and exclusive dramatisation uses action, narration, original music and evocative sound design to immerse listeners in a world that’s as thrilling as it is desolate. 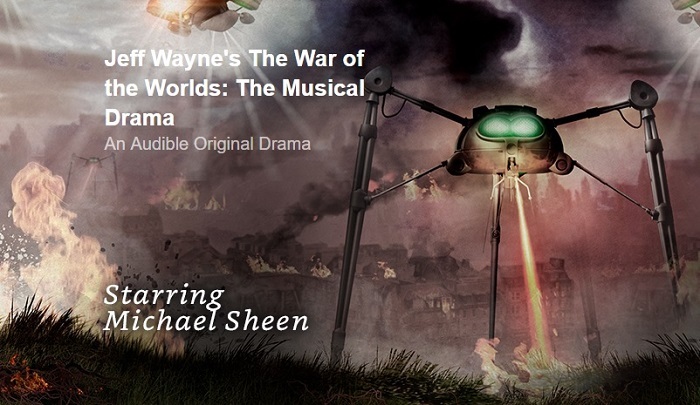 Jeff Wayne’s The War of the Worlds: The Musical Drama stars Michael Sheen, Taron Egerton, Adrian Edmondson, Theo James and Anna-Marie Wayne. Also featuring: Rachel Atkins, Pippa Bennett-Warner, Josh Bond, Nicholas Boulton, Philip Bulcock, Jessica Dennis, Stephen Fletcher, Pete Gold, David Holt, Roger May, Harry Myers, Richard Reed, Mark Straker, Ben Whitehead and Sarah Whitehouse. I have a friend who is recording books for Audible, and he's encouraged me to give it a try. And since my daughter is getting set up to do this in her home as well, I'm tempted to try. My Audible sf & fantasy library keeps expanding, thanks to their daily special offers and other limited-time deals... the books work perfectly with an Amazon Echo, of course, as well as plenty of phone and computery ways.